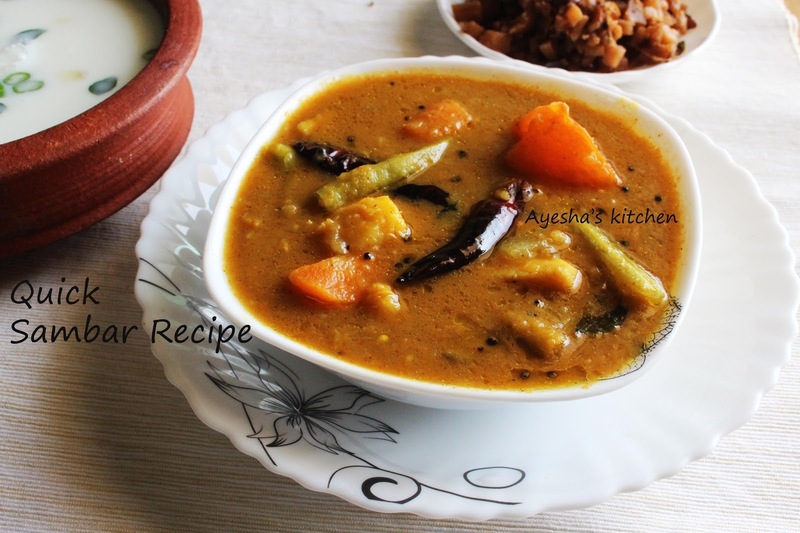 Sambar/sambhar is the South Indian dish which needs no introduction. It is a lentil based vegetable stew or chowder, based on a broth made with tamarind. It is popular in South India and Sri lankan Tamil cuisines. The most versatile easy recipes among South Indian dishes. Each family uses the ingredients in sambar in various proportions. This traditional kuzhambu has an important place in Indian Vegetarian recipes / Indian breakfast recipes. Here am gonna share a simple quick yet flavorful sambhar recipe.Some use homemade sambar masala powder and some store bought. You can check my Sambar recipe using homemade sambhar masala. 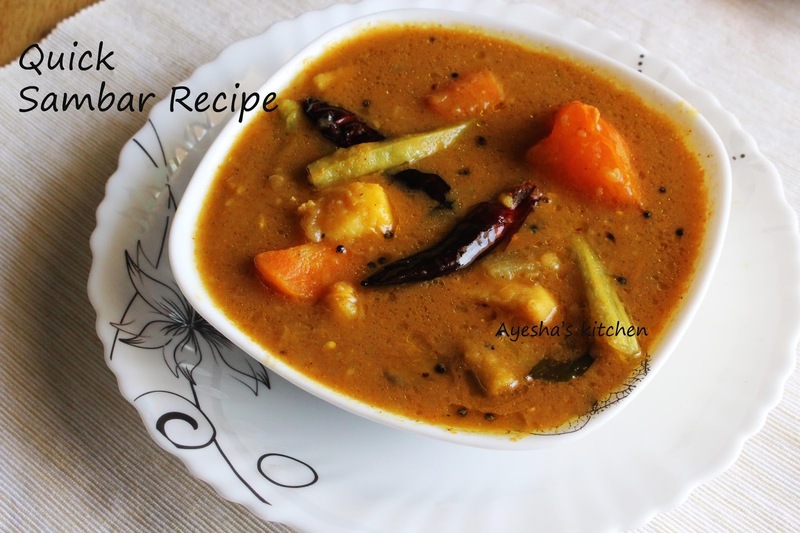 So let's have a look at the preparation of this instant quick sambar recipe. Cut all vegetables into small square pieces. In a pressure cooker, add moong dal and all vegetables except lady's finger, beans, and tomato. Close the lid and let it cook. Switch off the flame before the first whistle come. Never let to cook more as the veggies will become mushy. When done, let it stay for 2 minutes and then open the lid of the cooker by releasing the air. Again switch on the flame and add the remaining vegetables along with tamarind puree ( gently press the soaked tamarind with hands and squeeze the liquid discarding its seed), sambar powder and salt. Cook for few minutes or until the lady's finger (okra) is done over a medium flame. Finally, splutter mustard seeds and fry red chilies, curry leaves in hot oil and pour it over the sambar. Serve hot along with steamed rice, dosa or idli.